The Stokes Kith and Kin Community Blog: "As Long as They're Nice About It." "As Long as They're Nice About It." I had the very good fortune of knowing former Senator George A. Smathers, now deceased, and even of eventually becoming one of his law partners in the firm of Smathers and Thompson. I became an associate of that firm in 1972 and a partner five years later. 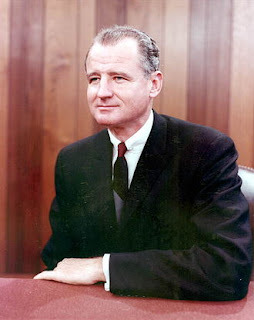 By the time I went to work full-time for Smathers and Thompson in 1972 (I was a law clerk during the summer between my second and third years of law school), Senator Smathers had retired from the Senate. By then he was active in two firms that he had founded. One of them was in Washington D.C., which was mainly a base for his lobbying, and the other his Miami-based firm. The Senator and I often had lunch together, usually on Fridays and usually at a place called "the Miami Club." Often those lunches had one or two others with us, but many times it was just the two of us. He was very open about many, many things, and I learned a great deal about, well, just how to behave. One of the things he said to me that I will never forget and that I often recall, is this: "Paul, it doesn't matter what people do to you, as long as they're nice about it." One of the applications of that proposition, he pointed out, is that when dealing with others, especially those with whom you are in very serious contention, one needed to be polite, civil, a gentleman or a lady, "nice," if you will. The Senator was that way. Now of course the Senator's proposition is hyperbolic, but there is so much truth to it. Having spent most of his adult life in the club called "the Senate," he knew how to deal with people on the other side of an important issue. By the same token, if you were going to cross him, and people often did, then you needed to be "nice" to him. He knew (and his colleagues in that chamber knew) that at some time in the future, a colleague who was presently an adversary would need his help on something some unrelated matter, something that would then mean much less to the Senator than it would to the present adversary. So people in the Senate - at least at that time - knew to be nice. He said that an important part of that approach is that one does not flee the field after a set-back. The Senator would remain very much a presence where ever he appeared, cordially welcoming an approach anyone, whether a former adversary or not, and especially an adversary who himself (or herself) had always been "nice." The Senator remained "nice" to others, even when others gave offense. He was a master at dealing with angry, self-centered people. That was simply one of his several his over-arching gifts: he was a master at dealing with people of all sorts.